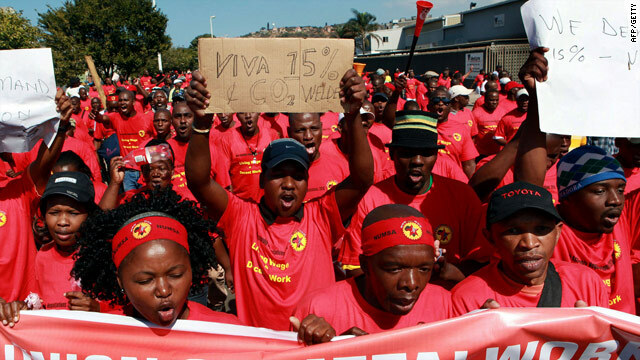 Union members rally in Durban, South Africa, on August 17. The country has seen widespread strikes in recent weeks. Johannesburgh, South Africa (CNN) -- Public sector workers embarked on a countrywide strike in South Africa on Wednesday. Nomusa Cembi, of the South African Democratic Teachers Union -- an affiliate of Congress of South African Trade Unions -- said hospital workers, education employees and civil servants demand better compensation and benefits from their government. "We are trying to bring them to their knees," Cembi told CNN by phone from Johannesburg, referring to the South African government. "We took a decision yesterday that we would go on strike indefinitely until our employer gives us a better offer." She said the strike is intended to raise wages 8.6 percent and gain a 1,000 rand ($137) per month housing allowance. They also want those improvements to be backdated to April 1 of this year. Cembi said medical benefits also are part of the negotiating standoff. It was unclear how long the strike might continue and protests are expected to intensify. South Africa's ministry of public service and administration said the rejection of the latest wage offer by labor and the announcement of an indefinite strike "has been noted with great concern." "We question how a responsible leadership can advocate for an indefinite strike action knowing why the demand cannot be met in this financial year, knowing the impact such action would have on the delivery of services to all the citizens of the republic, knowing the adverse effects it would have to the very members whose interests they represent," it said.